Actually there is an eighth module called the TrainJourneyModule. 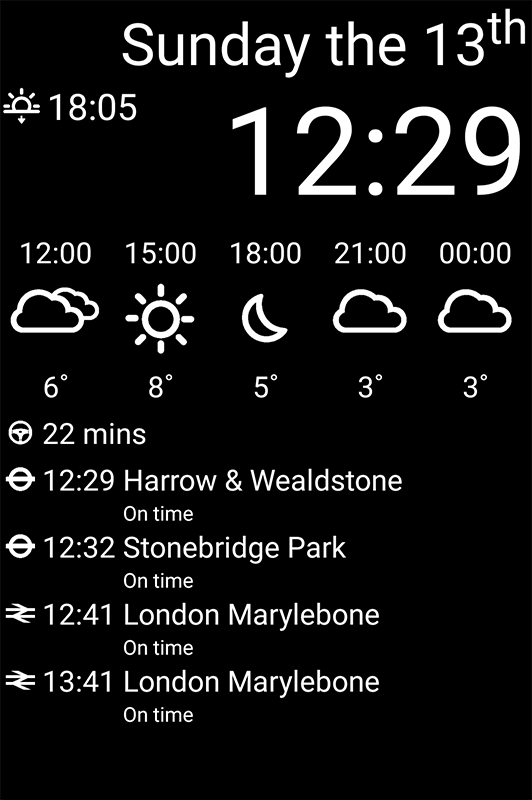 This is a meta module combining the output of the tube and national rail train times modules into one. It sorts them by departure time so both types are shown interleaved. For the data query part, Met Office, Tfl and Google Maps are using JSON. This is pretty standard nowadays and Java on Android has built-in support for parsing it. I was looking into more advanced JSON parsing libraries like gson and jackson but decided for the really simple task of parsing one static response it is not worth it to pull in those big dependencies. Maybe I will change that it the future, but for now the present code works just fine. Looking at JSON data in Firefox is much more comfortable by using a JSON document viewer add-on like JSONView. Element dep_request = new Element("GetDepartureBoardRequest", ldb). The user interface is quite simplistic. There is no way to interact with the application because it is behind a mirror. The only function the application has is to display the output of our modules in a nice and readable way. 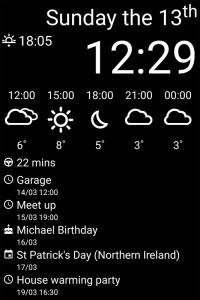 All the text and icons are white on black background. This ensures for best contrast behind the two-way mirror and makes it possible to see the information even on normal daylight. I tried to make all state changes animated, see for example AnimationSwitcher for the details. One interesting challenge is the code for switching to fullscreen for the different supported API levels. A nice feature of Android is that you can use new functionality of newer Android versions in your application and check at runtime if this new functionality is available. In your build.gradle you define the minimum supported Android version (minSdkVersion) and also the version your application is written against (targetSdkVersion). At runtime you check Build.VERSION.SDK_INT against the Android version when a specific feature was introduced. Only if this is equal or greater you can use this code. Now if you are below the required Android version you either need to fallback to other code providing similar functionality or your application can’t provide support for this particular feature (see e.g. CalendarView). Main.java contains four different functions for switching into fullscreen. In API level 13 and below the only way to do this was to set the FLAG_FULLSCREEN for the main window. Starting with API level 14, setSystemUiVisibility was introduced which allows a more fine grade configuration of the behaviour of the Android system when your application is in the foreground. Over the following Android versions more and more flags have been introduced. MirrorHub doesn’t come with any runtime configuration. Remember the user is not able to make any changes when the phone/tablet is attached to the mirror. All the configuration is done at compile time by setting the various options in the gradle.properties file. You can use gradle.properties.example as the start for your own experiments. It contains things like the location for the weather forecast or the tube/train station you like to have departure information displayed on your mirror. But most importantly it contains the API keys for the various web services in use as outlined here. I also added a runDebug/runRelease task to gradle which allows you to start the application without any physical interaction with the device. Together with an app like WiFi ADB you can install and run the application remotely while the device is attached to the mirror. However, please note that WiFi ADB needs a rooted device. I think the app has a lot of nice feature already. It runs on my mirror 24/7 and works just fine. 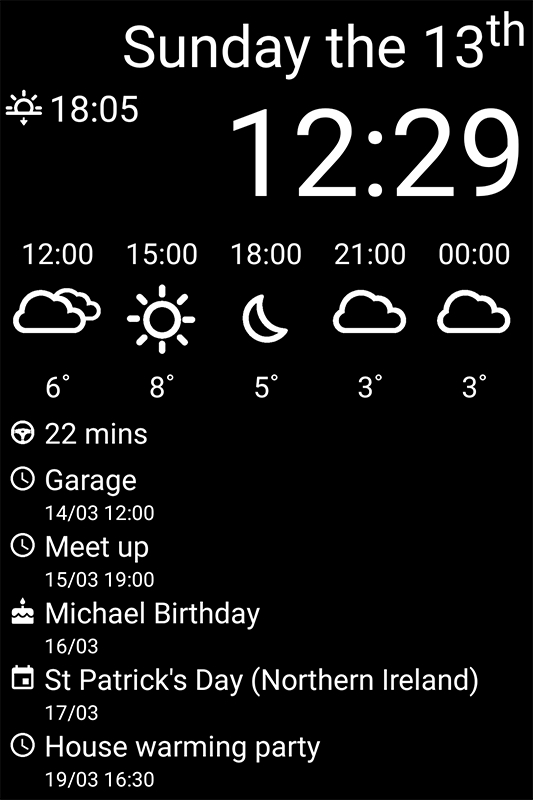 I still have some more ideas for modules, like a caldav module to display calendar events from a caldav server, because the Android version that I use has no direct calendar support. I also played around with the proximity sensor to detect some hand waving in front of the mirror. It works fine with just the device, but unfortunately not when the phone is behind the mirror. The code is still there, so if you have some ideas how to make something like this work let me know in the comments. For some images together with the mirror see the end of the first post.